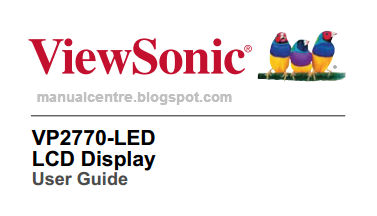 If you are owner of the ViewSonic VP2770-LED and there is a problem with your monitor, please check through ViewSonic VP2770-LED Manual on page 18. Some problems in the manual, for example about power, colors and control buttons. Make sure power button (or switch) is ON. Make sure A/C power cord is securely connected to the LCD display. Plug another electrical device (like a radio) into the power outlet to verify that the outlet is supplying proper voltage. Make sure the video cable supplied with the LCD display is tightly secured to the video output port on the back of the computer. If the other end of the video cable is not attached permanently to the LCD display, tightly secure it to the LCD display. If you are using an Macintosh older than G3, you need a Macintosh adapter. If any colors (red, green, or blue) are missing, check the video cable to make sure it is securely connected. Loose or broken pins in the cable connector could cause an improper connection. Connect the LCD display to another computer. If you have an older graphics card, contact ViewSonic® for a non-DDC adapter. Press only one button at a time. Besides about troubleshooting, you also read about tutorial how to Cleaning the LCD Display on page 20.